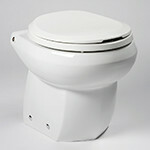 Aero | Toilets | Headhunter Inc. 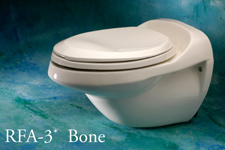 Designed specifically for luxury accommodations, the wall mounted Royal Flush Aero combines an elegant looking, comfortable, elongated toilet with patented and proven Headhunter technology. 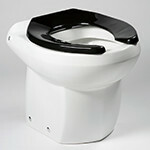 The result: a reliable toilet that matches the tasteful décor of any vessel. 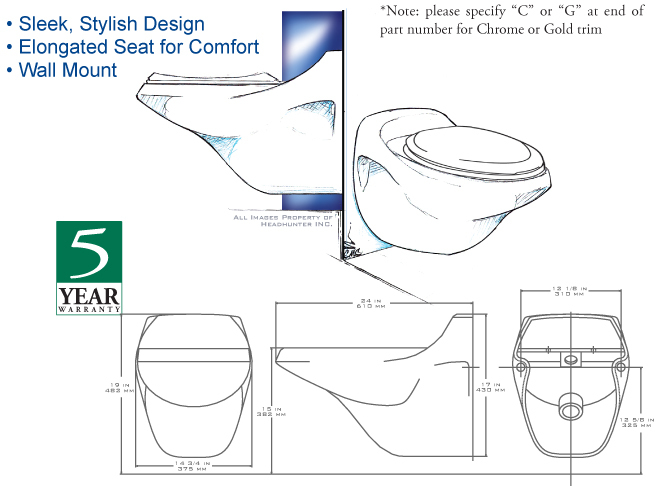 The Aero’s unique and carefully considered design yields a comfortable elongated seat in the same space that competitors deliver small round bowls. 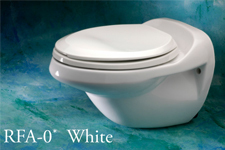 Like all of Headhunter’s Royal Flush toilets, the Aero is available in four designer colors; white, black, bone and sand, matching Kohler fixtures. Installation is easier and operation is quieter as there’s no vacuum nor macerator pumps. 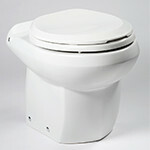 Because of the Aero’s wall mounted design, the ease of cleaning and sanitary considerations, it has become a popular commercial marine toilet. 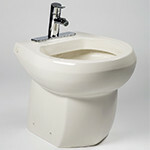 Install an Aero Bidet to compliment your Royal Flush Aero toilet. With the same elegant styling, it’s the perfect accessory for any luxury bathroom. The Aero bidet has the same dimensions as the Aero toilet and installation is a breeze with one our behind-the-wall mounting brackets. 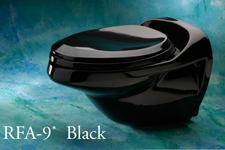 Designed to fit standard single penetration bidet fixtures, the Aero bidet is offered in the same four colors as all other Headhunter sanitary ware.